Cooks Cottage in Fitzroy Gardens, Melbourne. Captain James Cook’s famous Yorkshire cottage, which was dismantled brick by brick and shipped halfway round the world, has been made an honorary member of Welcome to Yorkshire. The house, which is classed as the oldest building in Australia, was originally built in Great Ayton, North Yorkshire, for the explorer’s parents in 1755. Tom Ashurst, from Welcome to Yorkshire, presents staff at Cooks Cottage with a Welcome to Yorkshire plaque. It was bought in 1933 by an Australian businessman for £800 after local bids reached just £300. He had the two-storey cottage dismantled, packed into 253 cases and 40 barrels, and shipped 10,000 miles from the Port of Hull. Cuttings from ivy plants in the garden were also included in the shipment and re-planted near the house once it had been rebuilt in Melbourne’s Fitzroy Gardens. Now one of the famous Welcome to Yorkshire pink plaques has been presented to curators at the cottage, which has become a popular tourist attraction. 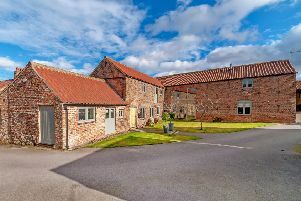 Sir Gary Verity, chief executive of Welcome to Yorkshire, said: “We are delighted to make Cook’s Cottage in Melbourne an honorary member of Welcome to Yorkshire. “Captain James Cook was one of the greatest explorers of all time and one of Yorkshire’s most important figures and to have a slice of Yorkshire heritage more than 10,000 miles away in Australia is incredible. Melbourne Deputy Lord Mayor Arron Wood said: “We are honoured to accept this membership to Welcome to Yorkshire and are extremely proud of Cooks’ Cottage, a favourite Melbourne attraction. The cottage is filled with furnishings representative of the period and has an English cottage garden outside. A stone obelisk now stands on the original Great Ayton site.